Make August your lucky month and escape the summer heat at SlotoCash Casino with free chips, free spins, and freerolls! Spin the reels on the best online casino games and test your luck with all the free spins and free chip coupons listed below. Keep an eye on this thread for new no deposit bonus coupon codes that will be added to the list as they are released, and if you find any SlotoCash no deposit coupons please share them below in the comment section. Most countries are welcome at SlotoCash except Moldova and Israel. Good luck and have a great month! 60x wagering requirement on slots, keno or scratch cards; $180 maximum cashout. Max bet rule applies. Prize Pool: $1000 Guaranteed; Start Date: August 1st, 2018; End Date: August 31st, 2018; Top 38 Places paid $5-$250! * If you are not a real money depositor, you may only cashout $180 once from any freeroll tournament winnings. 40x wagering requirement on slots, keno or scratch cards; $500 maximum cashout. Max bet rule applies. 'Banana Jones' is LIVE at Slotocash, Uptown Aces, Uptown Pokies and Fair Go! Offer - All 4 Casinos! Coupon CHERRY777 was redeemed. Congratulations! It's almost time for a new Sloto Magazine! Here's a sneak peek if anyone is interested. Most players go crazy over our Sloto Magazine thanks to the 3 month calendar that has a dozen or more Free Spins and Bonus coupons on special dates and holidays. These coupons are exclusive and you can't find them anywhere else online! Rack your brain to earn a free token by answering 3 simple questions. And find the password for exclusive tournaments worth thousands in cash prizes! Learn more about digital cryptocurrency and how you can use it to cash out at Sloto'Cash. Also, we reveal what the future might look like as Virtual Reality invades our day to day lives! Learn about our newest games and find exclusive coupons to play literally hundreds of spins! Promotions must be redeemed in order! 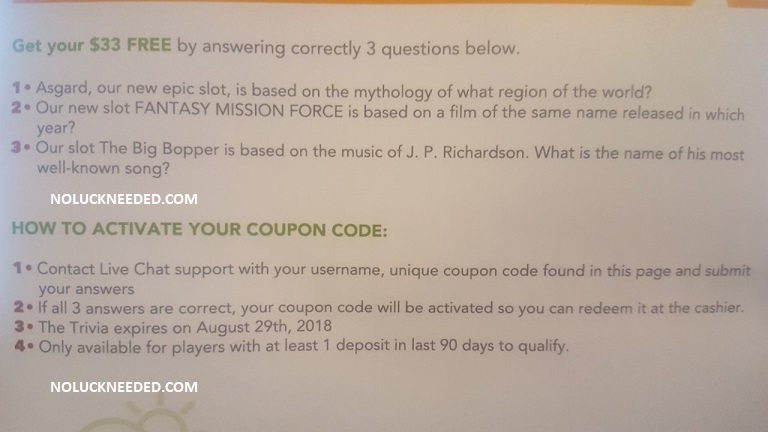 Deposit coupon requires a $35 min. deposit and it holds 25x slots or keno playthrough and no max cashout. $100 Subscriber ticket may be redeemed upon completion of 100MAG100 promo and it holds $400 max cashout. Both promos are valid until August 15th! Experience Sensational Luck this autumn! Boost your chances of winning by redeeming dozens of coupons and learning tips to optimize your play! Redeem the Bonus above now with a $35 deposit or more to be automatically subscribed to our Sloto Magazine Autumn Edition. 25 Free Spins at SlotoCash & Uptown! Thanks shirlsplay! 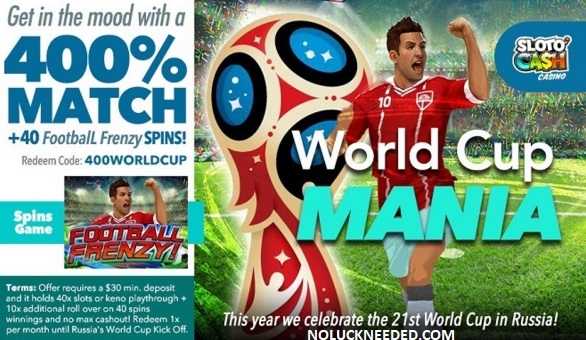 Courtesy spins hold $200 max cashout and they are valid TODAY ONLY! Multiplying your good fortune and giving your luck a boost is easy! Come play with us and try this unique game with 25 Free Spins on the house! 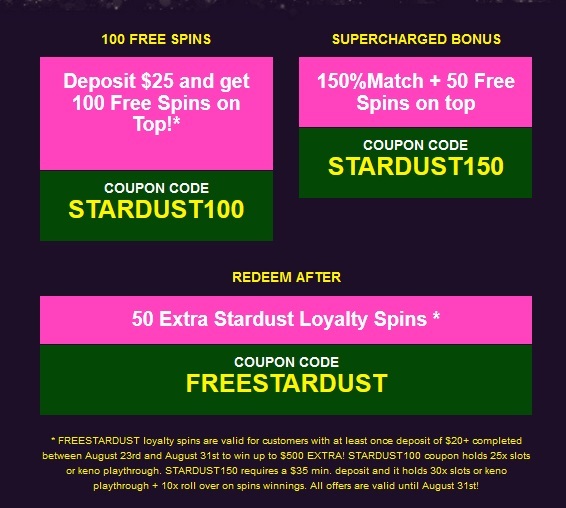 Trial spins hold $200 max cashout and they are valid TODAY ONLY! Slotocash, Uptown Aces, Uptown Pokies and Fair Go! Offer - All 4 Casinos! These codes are for SlotoCash & Uptown.